The Fuji Transonic 2.1 is a great value for riders who enjoy sprinting for the town line (click to enlarge). Fuji has a history of offering great bikes at a great value, but the Transonic line broke new ground. Could Fuji’s interpretation of the aero road bike continue that heritage? The answer, for the most part, is yes. During testing, the Transonic 2.1 was noticeably fast while sprinting and descending, had wonderful ride quality, and an excellent component group at a reasonable price. The lone detractor was climbing ability. This is not the bike to chase mountaintop KOMs. Bottom line, the Fuji Transonic 2.1 is a great value for cyclists who like go after the town line sprint, but not as attractive for weight-weenie climbing specialists. 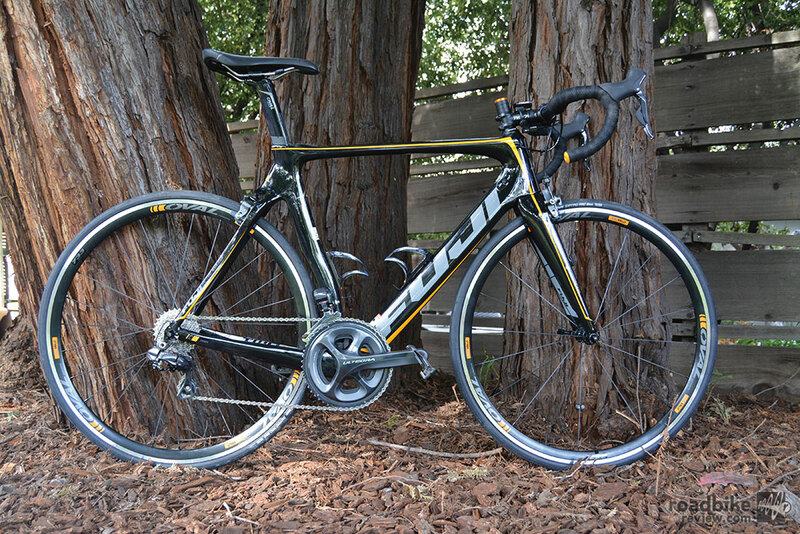 I’ve been a fan of Fuji bikes for years. 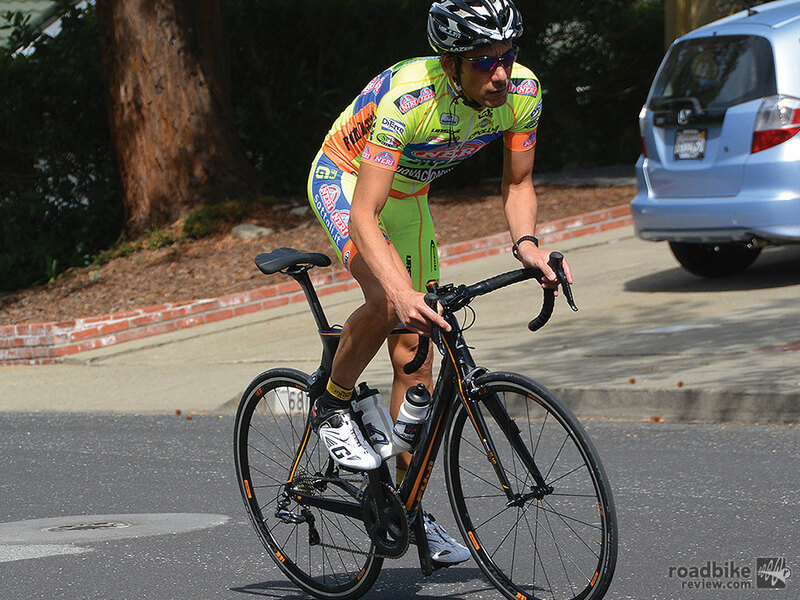 I owned and enjoyed a 1999 Fuji Team and a Fuji D6 triathlon bike. I’ve also ridden the Yahoo! Cycling team Fuji SL-1 and a 2012 Fuji Altimira. In every case, I was always impressed by the bike’s value-oriented parts kit and pleasing ride quality. As a triathlete and road rider, I’m also a fan of aero bikes. I own a 2011 Cervélo S3, which by many accounts was the benchmark for the first generation of aero road bikes. The Transonic in its element (click to enlarge). I was immediately impressed with the ride quality of the Transonic 2.1. Though over 17 pounds, the bike felt lighter. Steering response was excellent, both light and immediate. This was also the first time I’d ridden Shimano’s Di2 electronic shifting. It’s a game changer. Shifts are instantaneous and without drama. In the past I’d sometimes push a bigger cog longer than necessary because I was too lazy to downshift. But with Di2 I found myself shifting more frequently. It’s so easy and quick, which encourages gearing optimization. However, the up/down shifting of the Shimano levers is the opposite from the front chain rings to the rear cluster so there is a learning curve. 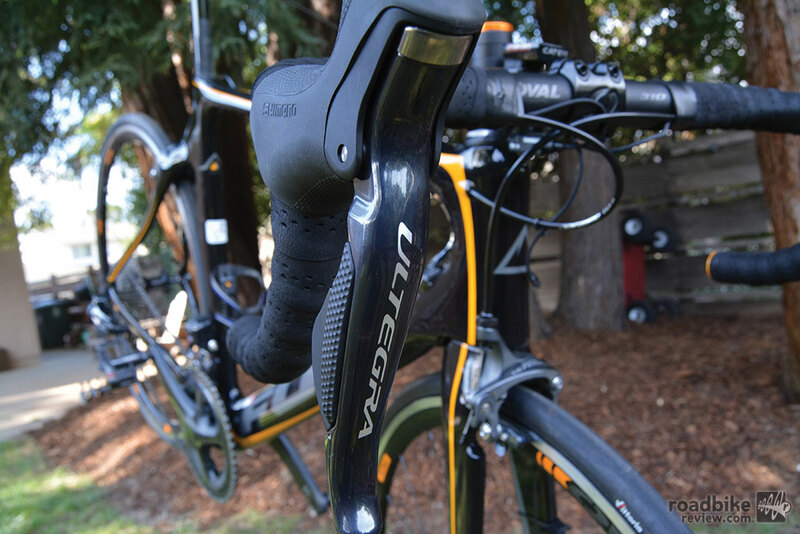 Ultegra Di2 levers have both outboard and inboard shifters, and comfy brake hoods (click to enlarge). I also appreciated the semi-compact gearing consisting of 52/36 chainrings and an 11-28 cassette, which allow for a tremendous range of gearing options. Braking was also very good, with Shimano’s new direct mount brakes that feature two mounting bolts instead of one. This adds structural rigidity and improves braking feel. On smooth roads, the silent hubs of the Oval Concepts alloy clinchers combined with the Shimano drivetrain make for a remarkably quiet ride. Fuji Wins Vuelta Stage 15! Sorry, didn’t see this. For the tri, the D6 for sure. It climbs well and flies when it’s flatter. It is an extremely fast bike. I really liked your review but have a question. Could the slugish feeling on the climbs come from the wheelset quality?